The 7504E was introduced in 2013 and entered legacy status in 2016 with the introduction of the 7500R series. Each line card has six packet processors. Each processor has 3 Gbytes. The same line cards are used in the 4- and 8-slot switches. These conclusions probably hold across all VoQ switches, independent of manufacturer. My [Warner's] opinion is that the first test is flawed. Here's an analogy. I want to test a highway bridge rated to carry 5 tons. I might carefully drive a truck weighing 10 tons across the bridge while monitoring it for distortion under load which would let me predict its reserve strength. What I would not do is run a 500 ton load across the bridge. I want stress the structure at a small multiple of its rating -- not destroy it. Massive overload of all the paths through the switch will cause most of crossbar arbitration requests to fail. A scheduler that can handle a credible overload may crumple into a whimpering ball on the floor. Most of the time, most of the input queues are empty and the scheduler can bypass them to focus on queues that contain traffic. But NetworkWorld's steady-state test fills all the queues simultaneously. If failed attempts to thread a packet through the switch fabric have the same cost as a success and the failure rate is pushed to astronomical levels, the test has nothing to do with reality. What this really demonstrates is the first bullet above. There are no standards for a microburst test. And when engineers try to make up a test designed to fit the test equipment on their bench, the results are not good. Hugh Holbrook gave a talk at Networking Field Day 10 in August 2015 with title 7500 architecture and Why Buffers Matter. It is about 30 minutes. The 7500E uses switch chips with external memory and crossbar chips. Both of these come from Broadcom. Buffer bloat happens when too much buffer is placed at the edge of the network. 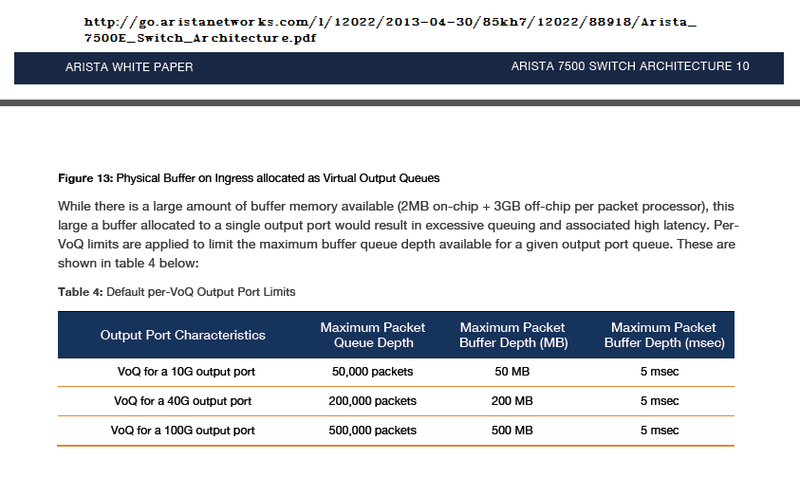 The 7500E buffers are at the core. 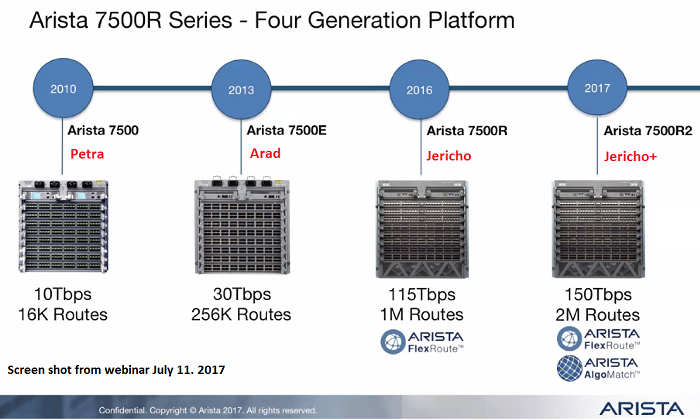 Arista has made four generations of dune switches.